Our beautiful, painted, mango and solid oak 8 seater dining tables create a stylish space to dine and host special occasions. Seating up to eight people comfortably, or even more on models with extending leaves, our impressive collection of solid hardwood 8 seater dining tables bring effortless style to your dining room. Built using the finest cuts of solid hardwood, chosen for their superior golden colour tones and remarkable grain pattern, each 5ft dining table (around 152cm) is made to be robust enough to withstand vigorous use for many years to come. Available in oak, mango, and painted oak, our diverse range of dining table styles makes finding furniture to complement your home easy. If you’re looking for the flexibility of being able to entertain additional guests when occasions come up, then our easy-to-use extending 5ft dining tables are the perfect solution. Browse our collection of stunning oak, mango and painted dining chairs, and mix and match with your dining table of choice. 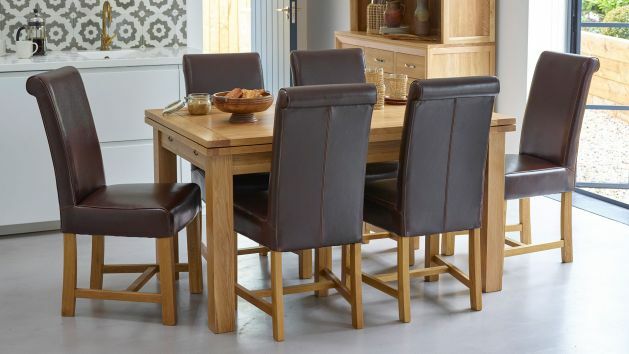 Or look through our sets of dining table and 8 chairs where we’ve already matched our these rectangle dining tables with the perfect set of seats, at an even more competitive price than buying it separately. Your dining room is more than just a functional space, it’s a place to unwind, enjoy good food and create lasting memories with friends and family. As such, your dining room should be an investment, and a place worth furnishing with quality furniture and accessories that can stand the test of time. A beautiful display cabinet can add a touch of class to your dining room, whilst also providing you with storage space for plates, glasses and other essential dinner party accessories. The Oak Furnitureland display cabinet collection features stunning pieces available in solid oak as well as painted and mango display units, which are all designed to complement our dining table ranges. Inject some character into the room with some wall art or a clock that reflects your personality, or alternatively, decorate the room with items and photos you’ve gathered while travelling for easy conversation pieces. As well as allowing you to put your own personal stamp on the space, unique features such as this can make for great conversation starters at dinner parties. Every purchase from Oak Furnitureland qualifies for free home delivery directly to any room in your house. For extra peace of mind, purchases over £500 can be spread across monthly payments for up to four years, while orders over £3,500 are eligible for interest-free credit for up to three years. Take a look at our furniture financing for more information.